I’m A Published Photographer, And NOT On WordPress! The original photo submitted to BMW ON. That’s right, I now have a photograph published in a monthly, international magazine! Every month BMW Owner’s News, the monthly magazine for members of the BMW Motorcycle Owners of America (BMWMOA) has a section of member submitted photographs called “Picture This!” BMWMOA announces on its website what the theme is and members can submit photos for possible publication in the magazine. Most pictures try to merge motorcycling and the theme if at all possible. 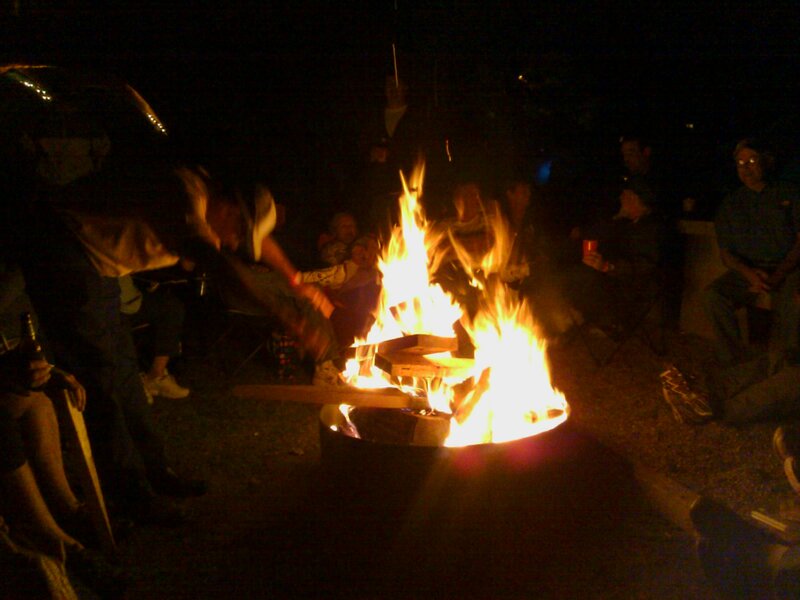 About two or three months ago, the theme was announced as being “Campfire” and I submitted a picture taken at the BMW Motorcycle Owners of Georgia (BMWMOGA) campfire on the first night of the Georgia Mountain Rally from 2011. The picture was taken with a 2.0 megapixel camera on an old HTC Ozone Windows Mobile smartphone of all things! That’s right, a cell phone photo. I took a chance and sent them the photo. Today, the July 2012 issue of BMW ON arrived in the mail and there it was; my photograph! 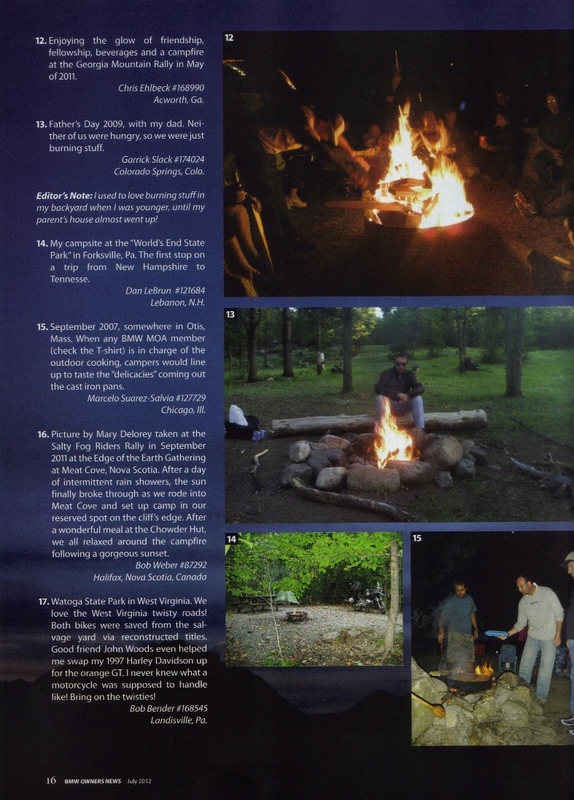 The picture is on page 16 and is photograph and caption 12. Not bad luck for a snapshot taken with a cell phone. The page with my photograph in the July 2012 issue of BMW Owners News. Revzilla, an online motorcycle retailer has put together a video from this summer’s BMW Motorcycle Owners of America rally in Bloomsburg, PA. This is something that really does look like it might be fun to go to sometime! I just thought I’d pass along the video. Today we came back from the Georgia Mountain Rally. Even though I was on the rally staff it was mostly work and no riding. That’s right, no riding. We rode the SUV up as I also had to bring a propane burner and a large cooler too. The last night of rally ended with the grill your own steak dinner and the bonfire. It was a really great and fun time all weekend! I even got to sit on and play with the new BMW K1600GTL. I also got my picture taken on it. We had over 660 motorcyclists register and attend the rally. Those motorcyclists came from 32 different states and 2 different countries! Instead of posting all the pictures of the rally here, I’ve just provided a link to them and you can see them by clicking here. I couldn’t resist posting one of the K1600GTL pictures right here though! We’re spending the weekend at the BMW motorcycle Owners of Georgia’s annual Georgia Mountain Rally in Hiawassee, Georgia. Over 660 motorcyclists are attending rally. The weather is beautiful with clear skies and tempertures in the 70’s. A surprise from Pandora’s European Motorsports was the appearance of their K1600GTL touring bike demo bike! I got to sit on it, start it and play with some of the gadgets. They weren’t allowed to give test rides because BMW Motorrad is not allowing any until Tuesday. I’ll write more when we get home. Our meeting for our rally team leaders for the Georgia Mountain Rally put on by the BMW Motorcycle Owners of Georgia was scheduled for today at the Georgia Mountain Fairgrounds in Hiawassee, Georgia. Our club President also decided to have the clubs meeting there preceding the rally team meeting. The purpose of the rally team leaders meeting on site at the Georgia Mountain Fairgrounds was so that we could walk through the site and to finalize our plans. Donna and I headed on up I-575 and GA HWY 515 and stopped in Blairsville for lunch along the way. It was a cool but nice day. We didn’t even need the liners in our jackets today. We got up to the fairgrounds and met our friends and had a good time. We rode 222 miles today and still have gas left in the tank! Yes that’s right, 222 miles on a single tank of gas. This weekend is the BMW Motorcycle Owners of Georgia’s annual Georgia Mountain Rally in Hiawassee, Georgia. It’s a weekend of motorcycles, camping, seminars, friends, riding, eating and vendors. We weren’t able to spend the whole weekend but did work at the registration desk for a few hours on opening day.